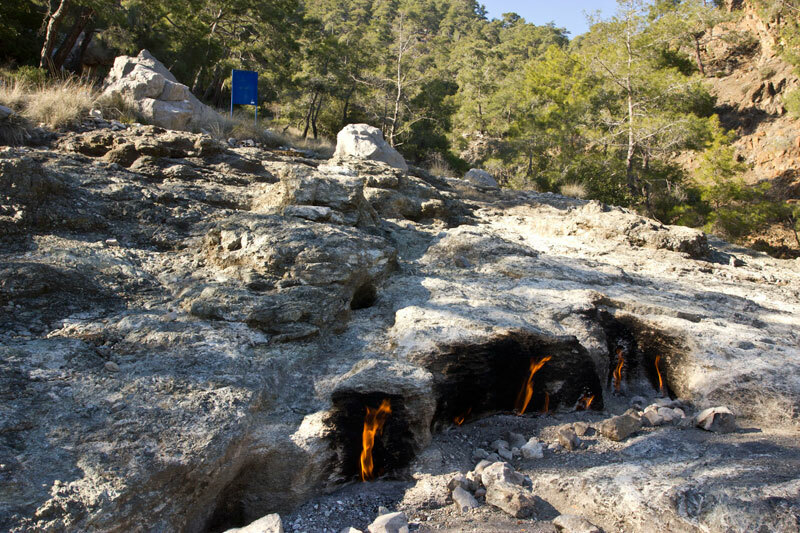 You are at:Home»Bizarre Tourist Attractions»The Flaming Rocks: A Hot Tourist Site in Turkey! The Flaming Rocks of Chimaera, Turkey are a one-of-a-kind location where the ground quite literally burns in nature’s version of an eternal flame. Located in southwest turkey approximately 50 miles west of the city of Antalya, there’s a rocky mountain area, situated just outside the small town of Cirali. Here, the rocks have been alight for at least 2500 years and it’s likely they’ll remain burning for many generations to come. The Flaming Rocks of Chimaera, Turkey span an area of over three square miles. They’re a natural torch of sorts, as they’re fueled by gas emissions that rise up through the voids in the rocks that comprise the mountainside of Mount Olympos. The gas that rises from these vents — which are called ‘yanartas’ in Turkish — is primarily comprised of methane. Methane is a lighter-than-air gas that’s usually created as organic matter degrades. But scientists believe that this is abiogenic methane — a rare form of methane that arises from other natural processes. 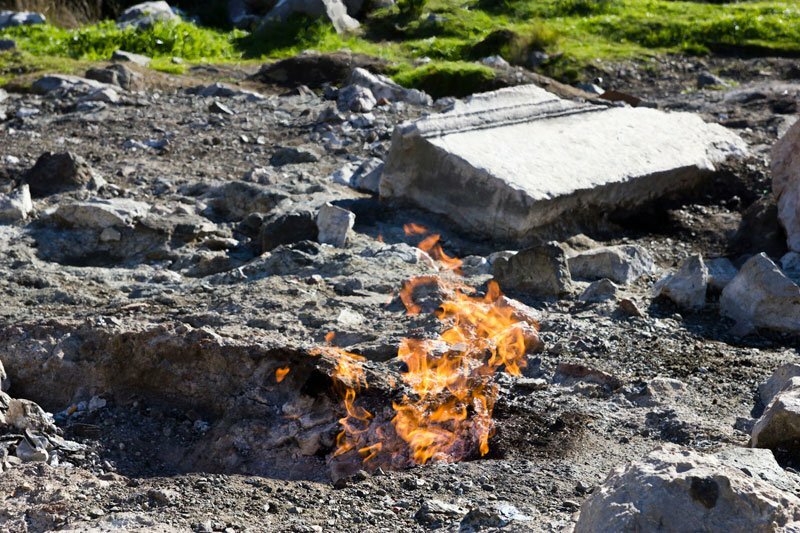 Hydrogen has also been detected rising from the vents at the Flaming Rocks of Chimaera, Turkey. For years, sailors would use the flames as a sort of natural lighthouse as they sail the nearby waters. Today, hikers make their way to the flaming rocks to brew tea and cook food. The fires tend to be larger during the colder winter. This is attributed to changes in atmospheric pressure and ground pressure, which is impacted by groundwater and other factors. 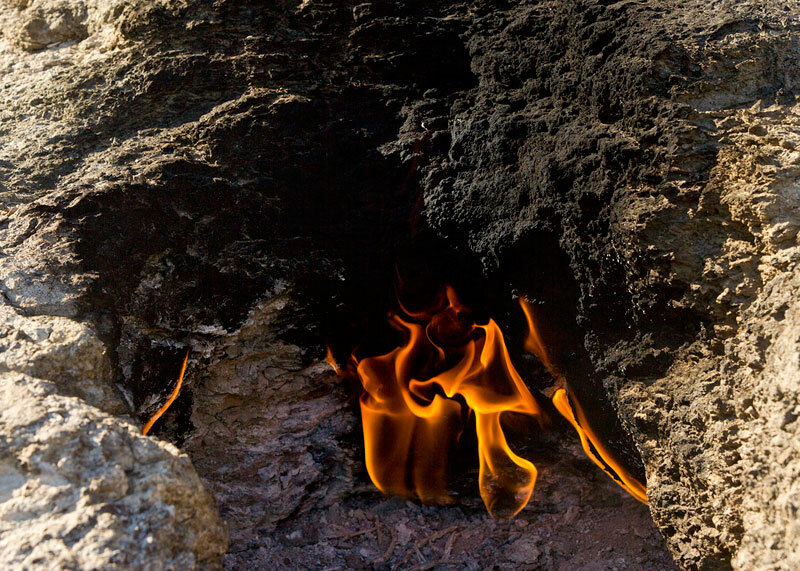 There is a myth surrounding the Flaming Rocks of Chimaera, Turkey. It’s said that they are the result of a mythical beast — called a Chimaera — that breathes fire. A Chimaera is said to have a lion’s head, with a goat’s head on its back and a tail that ends with a snake’s head. 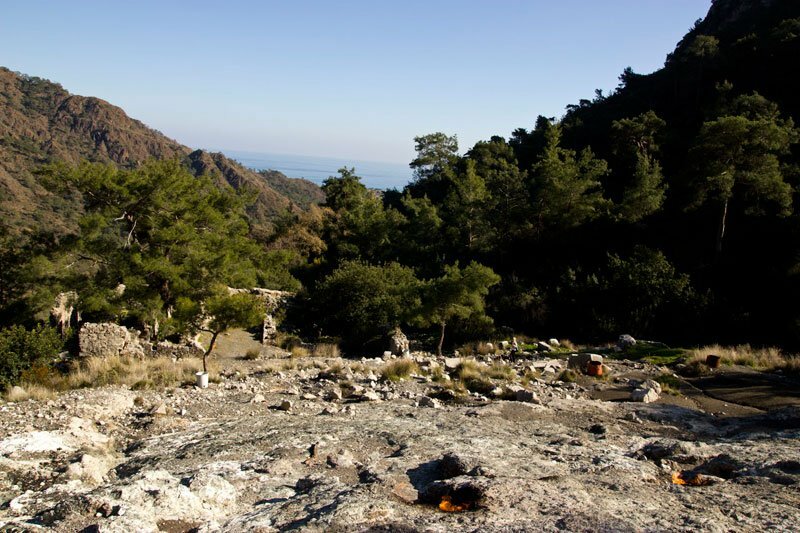 There was also a place called Mount Chimaera in an ancient Lycian city of Phaselis. Some have called the Flaming Rocks of Chimaera, Turkey a modern Mount Chimaera. The Flaming Rocks of Chimaera, Turkey never go out. They burn incessantly day after day, month after month, year after year. The fire vents are surrounded by ash and rock; any vegetation burned away long ago, so the fire does not spread to the surrounding forest. If you’re willing to camp in the region, then visitors will be rewarded with an incredible sight at night as the flames light the darkness.